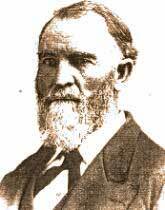 Mac Waller is not to be confused with the Methodist preacher Alvin Waller who also figured prominently in Oregon's pioneer history. Waller Hall on the campus of Willamette University is named for Alvin Waller. The Reminiscences of Mac Waller were published in serial form in the Christian Standard during the Spring of 1893. We have reproduced them here from the original microfilms made available through the courtesy of the Disciples of Christ Historical Society. They are a separate document from this profile and can be reached on this link. 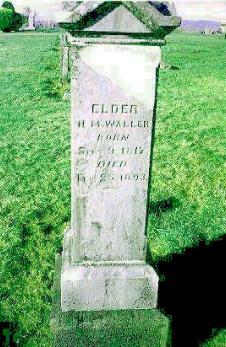 Hugh McNary Waller was probably the oldest in a family of at least seven children. His father, Thomas C. Waller, died in Illinois when Mac was 13. Mac Waller, from Pittsfield, Pike County, Illinois, had been successful in preaching in Illinois and Missouri during his 20s. One writer says "he converted thousands." When asked how he explained such results, Waller said, "Because the contrast between the Bible plea and the sectarian pleas was so great that it seemed a new light shining in dark places." Mac Waller has a message for this generation of preachers who prefer to look and sound like sectarians preachers. However, at thirty years of age his health had broken and he was sickly at the time he left for Oregon. He was carried in a chair to the pulpit for his final sermon at Pittsfield and then carried to the wagon as the wagon train left for the new land. The small caravan from Pittsfield was made up mainly of Church of Christ families. As he traveled, he regained his strength. We can imagine that he was treated royally by his brethren even though the journey was difficult. It was 1847 and Thomas Crawford McBride was riding his horse over the trail, coming from Missouri and settled in Yamhill County. Mac, his widowed mother, Jane McNary Waller, and his brother George Townsend Waller were overlanding with their brethren from Illinois. During the next several years, most of Macs brothers and sisters came to the land of Eden and settled in Polk County. While Mac was regaining his health on the overland journey, he may have seen Mary, the young daughter of Hezekiah and Melissa Davidson somewhere on the journey. Three years later, at age 33, he married Mary, 15 years his junior. Mac baptized her parents into Christ in 1851. It was impressive to stand by the grave of the Davidsons at Buena Vista and realize the history represented by their marker. Mac and Mary Waller had stood there more than 120 years ago thinking about eternity. Mac was 58 the year Hezekiah died. Melissa died the next year. "He was from Illinois. Timid and retiring by nature on ordinary occasions, when he stood before an audience and exhorted sinners to repent, his timidity fled and he was a veritable giant. It was said of him that he made more converts than any other preacher this country ever had." Mac Waller quickly became a circuit riding preacher par excellence. Still single when he arrived, he joined Glen Burnett and Dr. James McBride in planting and strengthening churches. His first project was the Jefferson Institute school building near present-day Rickreall, a few miles west of Salem. In the spring after he arrived, he organized believers there for Sunday meetings. The building served as a school in the mornings, court in the afternoons and a church on Sundays. There is a profile of Glen O. Burnett and Dr. James McBride. Follow this link for a full description of the Jefferson Institute. That same fall, he organized a church a little further south on the Luckiamute River. The elusive Luckiamute church may have been one and the same as the Lewisville church. Lewisville was in the Luckiamute Precinct and very close to the Luckiamute River. Follow this link for a longer discussion of Luckiamute. For the next few years the three circuit riders - Burnett, McBride and Waller - preached and planted churches in Polk, Marion, and Yamhill Counties. It was a great day for the undenominational cause of our Lord Jesus. In 1856, Waller was one of several circuit riders that established the Dallas Christian Church. A few years later, he was leading a new group at Salem. We can find traces of his work in McMinnville and Hillsboro. It is estimated that Mac Waller baptized more than 7,000 people to Christ, most of them in Oregon. Waller established a church at Eola. In 1863 it reported 73 members. It was among the first churches in Oregon to own its own building. For many years, Waller was active in gospel preaching in the entire Willamette Valley. His name shows up regularly being present at camp meetings and other activities among the churches. We missed, at our convention, Bro. H. M. Waller who resides at Monmouth. He was kept at home by serious illness of himself. Probably no man in Oregon has done more preaching and baptized more penitent believers than this faithful man of God, who is now nearing his three score and ten years. Mac and Mary are buried side-by-side at Hilltop Cemetery in Polk County. The marker is a prominent one in the south section. The once thriving community of Eola, to the west of present Salem, was incorporated in 1856. It was an important town in the 1850s and once vied with Salem to be the state capital. An important dock city, the main part of town was washed away by a flood on the Willamette River and was never rebuilt. It was once a steamboat stop and had a post office, a tan yard, a blacksmith, grist mill, a sawmill and, of course, a church. The name has been preserved in a street name, a county park and by several businesses spread along that section of Highway 22. 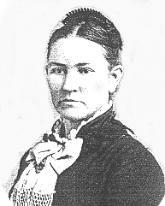 Mac Waller's sister Emily of Bethel, Illinois, married Harrison Brunk. These Christians lived in Missouri just prior to making the trip overland in 1849. The trip took nearly seven months and was completed via the Barlow Road. They took a Donation Land Claim northwest of Rickreall, then in 1856 moved to the site of "Brunk's Corner" at Eola, west of Salem. Harrison and Emily lived in a log house at Brunk's Corner at first and had the "Brunk House" completed in 1861. The house, listed in the National Register of Historic Sites, was constructed by a neighbor and cost $844, its elaborate Story and Clark Organ cost $34.35. The Brunk House is on Highway 22, six miles west of the Willamette River in Salem, just east of the Oak Knoll Golf Course. It provides insight into day-to-day living of the past. The Brunks were active members of the Eola Christian Church. Tours are available in the summer. photos of Harrison and Emily Brunk, go to this link. A large photo of the Eola Church building is also on a calendar available at the Brunk House. Ask for January 1994.